The Big Ten sent eight teams to the 2019 NCAA Tournament, one year after only four teams from the conference made the Big Dance, and seven of them won at least one game in the tournament. Here are Stadium’s postseason grades for every team in the Big Ten, which take into account the unofficial preseason media poll, conference and NCAA Tournament finishes, and recent program trajectories. 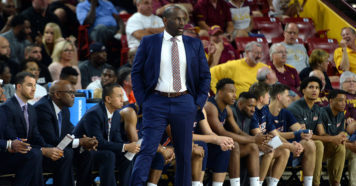 The Fighting Illini had a three-week stretch from late January to mid-February where they played like a team that would receive a No. 5 seed in the NCAA Tournament. OK, maybe that’s a bit of hyperbole. But Illinois won five of six including wins against Michigan State, Maryland, Ohio State and Nebraska. The problem is that Illinois was just 12-21 on the season, so that stretch included about 40 percent of its wins on the season. The Fighting Illini were picked to finish 13th in the unofficial preseason media poll and they tied for 10th, ultimately earning the No. 11 seed in the Big Ten Tournament, so Illinois managed to exceed expectations after a non-conference schedule in which it went 4-9. Freshmen Ayo Dosunmu, a former top-40 recruit, and Giorgi Bezhanishvili showed a lot of promise if they can continue to develop – but for Illinois’ sake, not at a rate that leads them to leaving Champaign for the pros earlier than Illinois Coach Brad Underwood expected. The Fighting Illini continued the tradition of Underwood-coached teams having a high defensive turnover rate, but most other advanced analytics weren’t too kind on Illinois’ play last season. A season that began with promise thanks a top-10 recruiting class headlined by five-star shooting guard Romeo Langford led to Hoosier dreams of potential Big Ten title contention and surely a return to the NCAA Tournament. Things appeared to materialize for the first two months until the season ultimately ended with a regional final loss in the NIT. Langford dealt with a thumb injury the entire season, four-star forward and former top-60 recruit Jerome Hunter was sidelined the entire the season was a leg injury, St. Mary’s grad transfer Evan Fitzner never materialized into a reliable stretch-four as he played a career-low 11.5 minutes per game and shot a career-worst 30.9 percent from three, while various other injuries added up amidst a stretch in which Indiana lost 12 of 13 in the heart of Big Ten play. Thanks to two improbable wins over Michigan State and a four-game winning streak to conclude the regular season, the Hoosiers nearly salvaged their season, but a loss to Ohio State in the Big Ten Tournament sent Indiana to the NIT. It was a disappointing conclusion for a team that was picked to finish third in the unofficial preseason media poll, that had the second-highest rated recruit (Langford) in school history in the modern recruiting era and in the final year of eligibility for All-Big Ten forward Juwan Morgan. The Hawkeyes exceeded their unofficial preseason media poll placement by four spots – from 10th to sixth – as they finished 10-10 in conference play, one season after going 4-14. Iowa’s offense finished 15th in adjusted offensive efficiency, thanks to a group of player that excelled at getting to the free throw line, and the team was above average at 3-point shooting, offensive rebounding and offensive turnover percentage. The Hawkeyes had a nice first-round upset over No. 7 seed Cincinnati and they nearly pulled off an epic comeback against No. 2 seed Tennessee in a second-round game they lost in overtime. Junior forward Tyler Cook declared for the NBA Draft and senior Nicholas Baer exhausted his eligibility, but the team returns guards and wings – Jordan Bohannon, Joe Wieskamp, Connor McCaffery and Isaiah Moss – combined with 6-11 forward Luka Garza. That returning cast should lead to another efficient offense and an offseason full of expectations in Iowa City. The Terrapins are coming off of their most conference wins in a season since the 2015 season, when Maryland went 14-4 in its first year in the Big Ten. Granted, the conference moved to a 20-game slate last season, but the Terps’ 13-7 record and fifth-place finish was productive for a team picked to finish seventh in the unofficial preseason media poll. Unfortunately for Maryland fans, the team’s NCAA Tournament fate – a No. 6 seed and a second-round exit – was perhaps all too familiar for a program that’s received between a No. 4 and No. 6 seed previously under Mark Turgeon and had tournament exits ranging from the first round to the Sweet 16. 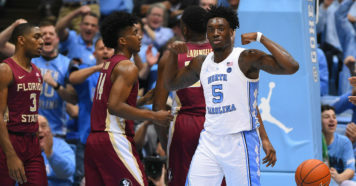 The team’s three top-100 recruits from its 2018 recruiting class had solid seasons, most notably 6-10 forward Jalen Smith, and Maryland was on the cusp of a Sweet 16 appearance with its 69-67 loss to No. 3 LSU in the second round. Three months ago, Michigan was on the verge of extending its undefeated start to a school-best 17-0, including a 6-0 mark in Big Ten play, but the Wolverines were just 13-7 in their final 20 games. They lost to Michigan State three times in the span of 34 days, which combined with three road losses to mid-level Big Ten teams Wisconsin, Iowa and Penn State, proved to be enough to shut out the Wolverines from claiming the Big Ten regular season or tournament titles. Michigan, which had a top-five offense three times from 2013 to ’17, has become a defensive-minded group in the last two seasons, and the Wolverines met a group that was even better – in fact, much better – on that end of the floor in Texas Tech. 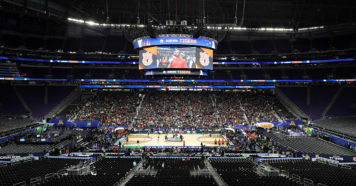 The Red Raiders sent the Wolverines home in the Sweet 16 with a 63-44 loss in which Michigan was just 1-of-19 from three – with the only three coming from a walk-on in the closing seconds of garbage time. The team’s top three scorers – Ignaz Brazdeikis, Jordan Poole and Charles Matthews – all declared for the NBA Draft and it seems unlikely multiple members of that trio will return, which means that Michigan’s 30-win campaign in 2018-19 will probably feel just a bit empty despite the team’s high level of play, especially in the first two and a half months of the season. The Spartans were picked to win the Big Ten in an unofficial preseason media poll as they received 386 out of a possible 392 first-place votes. That pick was accurate. Michigan State shared the conference regular season title with Purdue, then the Spartans defeated Michigan to win the Big Ten Tournament. Two weeks later, they knocked off No. 1 overall seed Duke as they returned to the Final Four for the eighth time under Coach Tom Izzo. The Spartans ultimately ran into the generationally elite defense of Texas Tech, which left Michigan State short of its third national championship. But thanks to AP First Team All-American point guard Cassius Winston, Michigan State’s 2019 season should be viewed as nothing short of a resounding success, especially in light of the season-ending injury suffered by Joshua Langford and later injuries to Nick Ward and Kyle Ahrens. For a team that debuted at No. 10 in the preseason AP Top 25, Michigan State proved that it absolutely belonged in the top tier of college basketball teams last season. The Golden Gophers finished seventh in the Big Ten after being picked to finish ninth in the unofficial preseason media poll. An NCAA Tournament appearance, which included a win over No. 7 seed Louisville, was a productive finish in Year 6 of the Richard Pitino era at Minnesota. That earned Pitino a two-year contract extension through the 2024 season, so overall, it was a productive season for the program, its coach and its players. Jordan Murphy was named a Second Team All-Big Ten selection and Amir Coffey made the Third Team. The Gophers had a rough February against a challenging Big Ten schedule but they beat Purdue twice in March, advanced to the semifinals of the Big Ten Tournament and picked up their first NCAA Tournament win since 2013. Nebraska’s season is tough to evaluate. Ultimately, the Huskers were a 17-loss team that finished 13th in the Big Ten and saw their coach get fired. Sure, forward Isaac Copeland’s season-ending injury lowered the trajectory and margin for error for Nebraska, and the team was essentially playing a six-man rotation by the end of the season due to a combination of injury and suspension. The Huskers were picked to finish fourth in the unofficial preseason media poll and they were fifth among Others Receiving Votes in the preseason AP poll. The team was 13-6 (3-5 Big Ten) heading into the game in which Copeland got hurt, so Nebraska’s season was already trending toward falling short of preseason expectations before his injury. With an average Big Ten offense and the conference’s least-efficient defense in conference play, a shorthanded Nebraska team was going to have trouble making the tournament. The Huskers’ three-day run in the 2019 Big Ten Tournament was an entertaining final memory of the Tim Miles era at Nebraska, which paved the way for former Chicago Bulls coach Fred Hoiberg to take over. The Wildcats lost 12 of their final 13 games, finishing the season 13-19 overall and in last place in the Big Ten. Northwestern was picked to finish 12th in the unofficial preseason media poll, so the ‘Cats were never expected to be great last season but they were even worse than expected. They beat one NCAA Tournament team all season – a 68-50 win over Ohio State on March 6 – and half of their wins came against non-conference opponents that finished outside of the top 200 on kenpom.com, so there weren’t even hints of promise. Northwestern actually finished in the top 20 nationally in adjusted defensive efficiency but the Wildcats had major shooting issues, ranking outside of the top 300 in 2-point and 3-point percentage. With the graduation of Vic Law, Dererk Pardon and Ryan Taylor, plus the decisions to transfer by Aaron Falzon, Barrett Benson and Jordan Ash, Northwestern has a lot of production and roster spots to fill, which means there could be more tough times ahead for the Wildcats. It wasn’t always pretty but the fact that that Ohio State team had a productive non-conference schedule that buoyed a challenging Big Ten slate and allowed the Buckeyes to make the NCAA Tournament, where it knocked off Big 12 Tournament champion Iowa State, is impressive. Ohio State had three former top-100 recruits, according to the Recruiting Services Consensus Index (RSCI), all of whom ranked between the high 60s and low 80s. Sophomore Kaleb Wesson was a productive focal point inside on offense and Wake Forest grad transfer Keyshawn Woods was really impressive in the final month of the season. The Buckeyes’ offense, which ranked 13th in Big Ten play, could be a tough watch, but they had one of the 25 most efficient defenses nationally. Ohio State didn’t reach the heights it did in 2018 but it was yet another impressive coaching job from Chris Holtmann in Year 2. The Nittany Lions are one of the weirder teams in the conference to evaluate. They finished No. 43 on kenpom.com with a top-80 offense and top-30 defense but they were just 14-18 on the season. An 0-10 start to Big Ten play essentially removed any chance of a postseason invitation for Penn State, but the Nittany Lions admirably finished 7-3 in their final 10 regular season games. Wins over Michigan, Virginia Tech and Maryland were impressive but the sheer quantity of losses was obviously less than ideal. The conference’s media picked Penn State to finish 11th and the Nittany Lions tied for 10th and earned the No. 10 seed in the Big Ten Tournament, so they roughly lived up to expectations. Lamar Stevens earned First Team All-Big Ten honors and Josh Reaves was named the conference’s Defensive Player of the Year, but the team was unable to take a step forward that some fans may have hoped for after Penn State’s NIT title and 9-9 finish in the Big Ten in 2018. Here was a team with moderately high expectations (read: picked to finish fifth in the unofficial preseason media poll and ranked No. 24 in the preseason AP poll) that shared the Big Ten’s regular season crown, went more than two months with just two losses, earned a No. 3 seed and was this close to making the school’s first Final Four since 1980. It appeared that junior guard Carsen Edwards, a consensus Second Team All-American, hit a wall late in the season – but he proved that was absolutely not the case, putting up better numbers in the NCAA Tournament than Steph Curry and cementing himself as a March legend. His usage rate and importance to Purdue was just as significant as almost any other player in the country for his respective team but the Boilermakers also surrounded Edwards with other great 3-point shooters, a really big point guard in Nojel Eastern and a productive center platoon in Matt Haarms and Trevion Williams. Purdue’s 6-5 start to the 2019 season taught us that we should be careful overreact to future slow starts for projected top-25 teams who play difficult non-conference schedules, lose close games away from home and still have impressive efficiency numbers despite the losses. The Scarlet Knights’ seven conference wins in the 2019 season matched their combined total from the previous three seasons. Rutgers had been the laughingstock of the Big Ten and the Scarlet Knights were a competitive team last season, which was a huge step forward for the program. After being picked to finish last in the Big Ten, Rutgers earned the No. 12 seed in the Big Ten Tournament after tying for 10th in the conference standings. They had the same conference record as Illinois and Penn State, and finished just one game behind Ohio State and Indiana. They beat Iowa, Minnesota, Ohio State and Indiana. A 14-17 record and a finish in the bottom half of the Big Ten isn’t something to be celebrated, but for a school that’s just three years removed from a 1-17 conference record, finishing as a top-80 team nationally, according to kenpom.com, is a positive development. A first-round loss to No. 12 seed Oregon in the NCAA Tournament is certainly a disappointing end to Wisconsin’s season – especially since UC Irvine upset Kansas State within the Badgers’ pod – but the Ducks won 10 straight late in the season and they had one of the best defenses in the country. Wisconsin was picked to finish sixth in the unofficial preseason media poll and it finished fourth as part of a 23-win season. The Badgers were seventh among teams in the Others Receiving Votes category in the preseason AP poll and they were No. 21 in the final poll (and No. 16 on kenpom.com), so they outperformed expectations in the regular season, even if their two tournament losses were by double digits. Ethan Happ was a consensus Second Team All-American, a fitting honor for one of the best players in Wisconsin history.